It seems a long time since April when the name of Hanson’s latest album was revealed and the countdown to its release began. Much has happened in the in-between time. Almost the last step on the road to the actual tour was a stop over in London during the first week of July. Hanson’s UK promo included breakfast television, a performance on a balcony of the Westminster Central Hall opposite Westminster Abbey, attending a film premier, interviews on local BBC radio stations, an appearance on a daytime current affairs show by Taylor and interviews with radio, press and online shows. Most of that promotion has now been released although we would expect some surprises still to come. Unlike in the US, there was little opportunity for fans to touch base with the band but Hanson subsequently acknowledged the “friendly faces “ that turned out to greet them at various places across London. The general tenor of the promotion was fairly predictable with conversation about Mmmbop, mmmhops, Anthem and the tour in December taking pride of place, however there were also some wonderful moments of quirky randomness – which allowed for Hanson insight and humour to reveal itself. 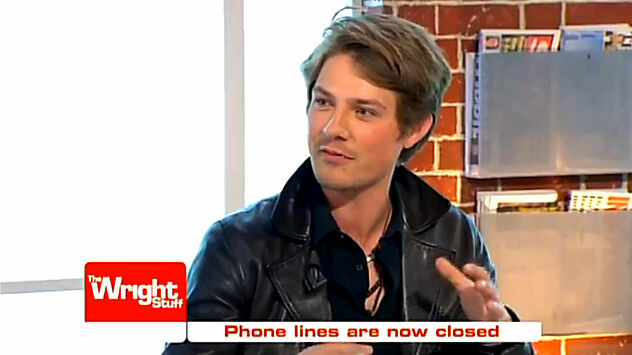 On the programme “The Wright Stuff”, Taylor Hanson appeared as a guest to share his thoughts on current UK news. The conversations ranged from Britain’s nuclear deterrent, through unusual children’s names, what people should be allowed to write on their gravestones, to the use of mobile phones at supermarket check outs. Taylor’s comments throughout were assertive yet humble, insightful yet restrained, intelligent yet unassuming. His admission that he would be the guy on the phone while packing his shopping at the supermarket, and his assertion that he wouldn’t like to talk out of turn in someone else’s country demonstrated the honest and gracious attitude that fans love and admire. If the other panelists seemed a little overwhelmed at times, it was maybe that they hadn’t expected this young rock star to be quite so comfortable in his own skin and mature beyond his years. Cut to the end of the week and Hanson were found on the balcony of Westminster Central Hall, recording for @BalconyTV and marveling at its location opposite the historic Westminster Abbey and near to Big Ben which they renamed “Big Old Clock”. Hanson playing live music on the roof of a public meeting space which has welcomed Sir Winston Churchill, Dr Martin Luther King and Mahatma Gandhi is as random as it is exciting and appropriate. 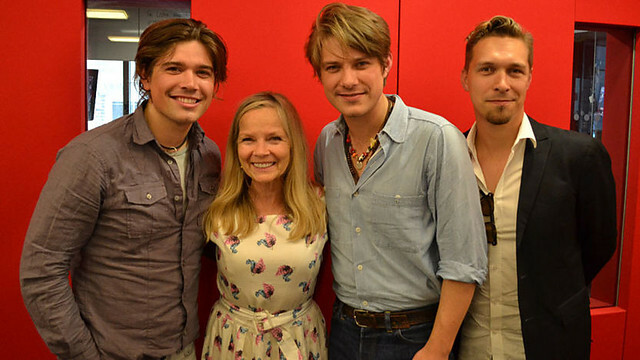 But one of the best moments of the week was the Radio London interview with Jo Good, where Hanson delighted her with a strawberry, complimented her vintage wardrobe, sang an impromptu Tragic Symphony and spoke movingly about their passion for writing songs which can express emotions for people who are experiencing difficult circumstances. 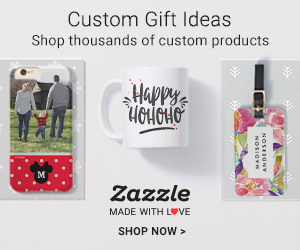 In several interviews over the years, Zac Hanson has revealed that they care deeply, that their gift of music can express things on behalf of others – from the man who works in an insurance office, to a young woman caring for her mother, to someone recovering from sudden illness. This capacity, which is far from random, has drawn fans to be loyal and this loyalty does not go unrecognised by the band. In this same interview, Taylor expressed Hanson’s sincere gratitude and respect for fans who have stuck with them over many years – again, there is nothing random here. This interview ended with observations about the nature of some radio interviews in the US, with comments about “shock jocks”, birthed by Howard Stern and others. Jo Good’s assertion that some seemed to want to “outdo their guests” with their own “circus acts” drew sighs of appreciation from Hanson who promptly asked for her autograph and a request that she travel across America with them in the future. During this interview, Isaac Hanson disclosed that they were “fueled by random”, meaning that the unpredictable, accidental and unexpected, were all grist to their musical mill. Whether celebrating July 4th with a curry or renaming historic English monuments – making music in some very small and unusual places or trying to pass The British Test by identifying Morris dancers, Hanson’s mix of random and deliberate UK Promo was another successful step in fueling the fire of Anthem, and paving the way for the Tour.